ACLATHAN is resistant to hydrolysis. This has a good influence on its durability and ageing resistance. On account of the excellent physical and chemical properties the hydrolysis-protected ACLATHAN material is especially suitable for seals. 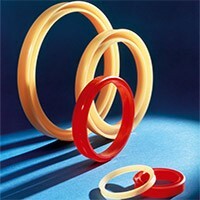 ACLATHAN seals are supplied in the hardness range of 90 to 96 Shore A as standard.